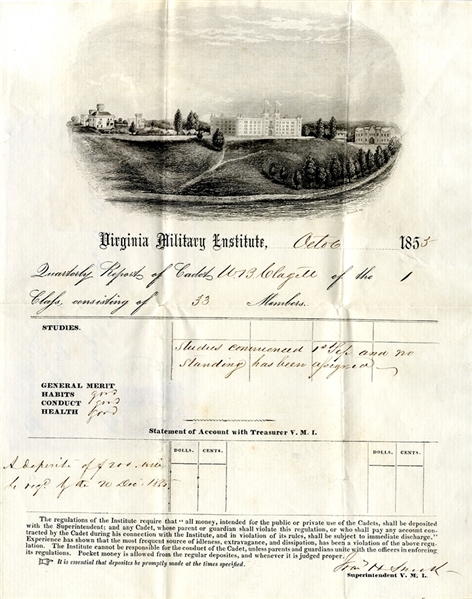 A finely illustrated Virginia Military Institute report card, 1p. 4to., issued to Cadet William B. Clagett (during the war a private in the 18th Virginia Cavalry), dated Oct. 6, 1855. His conduct is noted as "good" is a class of thirty-three. Signed at the lower right by the man known as the "builder and rebuilder of V. M. I.," Superintendent Major General Francis H. Smith (1812-1890). Also included is the original stamped transmittal cover with the back flap embossed "Superintendent's office Virginia Military Institute," addressed to: "Dr. T. H. Clagett, Leesburg, Loudoun Co., Va." Near fine.